Today I'm channeling my inner secretary.. my rock star inner secretary that is! Rowan's also rockin it out in her papa's band tee. Oh gosh, her sweet tummy kills me. both so cute! love the blouse--the way the stripes are is very unique. Lookin' good, Mama! Love Rowan's cardigan! It totally completes her fab outfit. You are such a fashionista--I love your mama/baby style posts! 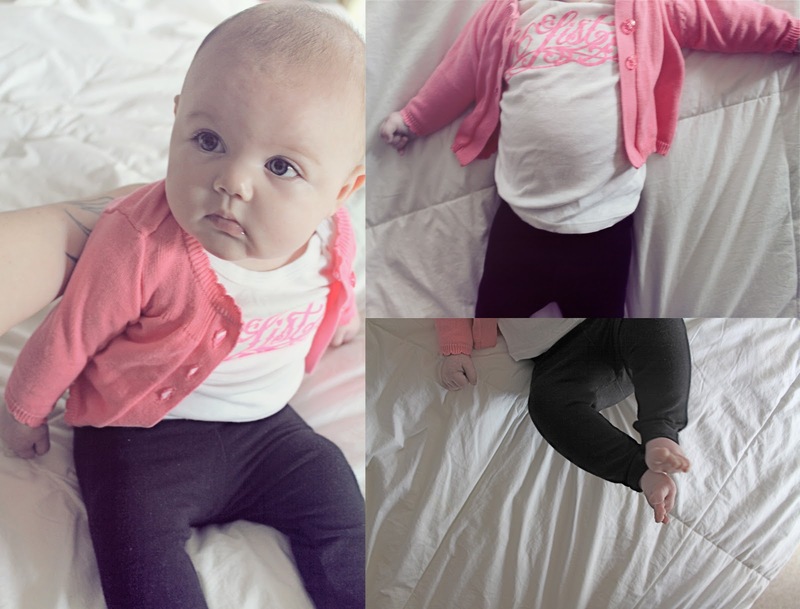 Rowan is so adorable and equally as fashionable--your taste in baby clothes is fantastic and so original! Which Etsy shop did you find your locket??? holy christ, that is a gorgeous baby girl. you just gave me the baby craving again! i have two boys, myself, but i just melt over the sweet little girl clothes. that cardigan is precious. and you look fantastic. Your outfit is so cute! So is Rowan's!!! Love Rowan's band tee, too cute!!! :D i love ro's little 86list tee! and its pink!